It’s time for more cool, new stuff out of PAX West 2018 for some of our most anticipated, upcoming games. Today, Warner Bros. and IO Interactive dropped a new teaser trailer for a new location in Hitman 2. This time, with an introductory “welcome to the jungle” in a press release, the game takes players to Colombia. The Colombia section in the game promises to be home to many unique challenges, as the stage is set in the middle of a South American rainforest. The trailer opens in said jungle, with Agent 47 stalking soldiers of some sort using the natural foliage as cover. The trailer reveals nothing else, but the press release suggests keeping an eye on the regular places for more on the Colombia stage soon. Hitman 2 is of course the follow-up to IO Interactive’s Hitman, which was an interesting, episodic take on the classic franchise. Since that game came out, IO Interactive went independent, breaking off from Square Enix and retaining the rights to its IP. For Hitman 2 the episodic thing has been dropped, and Warner Bros. is publishing. Also available as a standalone experience is Hitman: Sniper Assassin, which is a mode that two players can play cooperatively. IO Interactive is currently running a contest in the game, which you can gain immediate access to with a Hitman 2 preorder. 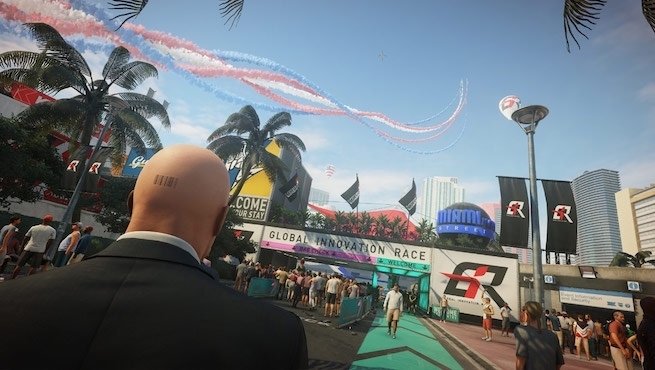 The player with the highest score in solo mode when the contest ends will win the prize of having their name and likeness inserted into Hitman 2.